Follow our expert guide to help you plan the bathroom you've always dreamt of, no matter what size it – or your budget – is. Your bathroom or shower room should be functional and practical, but also a place where you can unwind. Read on for tips and advice on how to strike the best balance. Whether you have a small or large bathroom, you'll want to get the best for your money. That's why we surveyed Which? members to find out what they thought of the big bathroom brands they've used, including Bathstore, Victoria Plum, Homebase and B&Q. Visit our guide to the best bathroom brands to find out which came top for quality of products and finish, customer service and value for money. Is it a family bathroom? If so, you'll probably want to factor in lots of storage space. Do you always shower and rarely bathe? Consider a standalone shower or wet room instead of installing a bath you won't use. If you like baths and showers, a bath with a shower it gives you a flexible option. Is space at a premium? Think about how you could incorporate storage cupboards on the walls rather than floor – maybe above the bath or even built in underneath. Do you want to use your bathroom to relax in? Consider getting a freestanding bath for a luxurious feel, and having somewhere close by to store candles and magazines. Are you a couple sharing the bathroom? How about getting two basins to make getting ready in the morning less chaotic? If someone will be using it to do make-up or dress in, then you'll want to make sure there is plenty of light and a decent-sized mirror. Asking yourself these questions will help you refine the little changes to make or elements to incorporate that will make a lot of difference to your bathroom and your enjoyment of it. You can visit our page on bathroom furniture for more information on planning the storage in your bathroom and to discover how bathroom owners rate bathroom furniture from big-name brands such as B&Q, Victoria Plum and Bathstore. 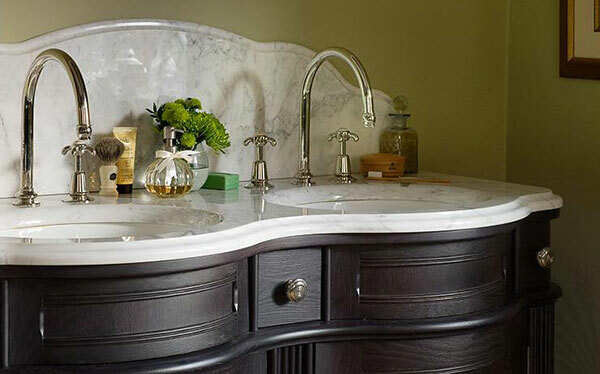 Read on below for luxury bathroom ideas, as well as how to update your bathroom on a budget. The bathroom is generally one of the smallest spaces in the house, but that doesn't mean it can't be luxurious, even on a budget. Small touches, such as expensive-looking tiles or taps, will have more impact in a small space and won't be too costly. For inspiration, flick through our gallery below for design ideas that will add a touch of luxury to any bathroom. You can use pretty much anything for your bathroom floor as long as it’s waterproof and won’t get too slippery when wet. These days, most people choose tiles (marble or granite look good), sheeted or tiled vinyl (a sensible option if you’re on a budget), or wood-effect laminate. It’s also possible to have a hardwood floor, but you’ll need to treat it and make sure you don’t leave it wet. For an ultra-modern and very practical effect, you could even use concrete. Underfloor heating adds a really cosy touch – as well as helping to dry the bathroom, and prevent damp and mould from forming – if you have hard floors. If you're considering underfloor heating, visit our guide to get an idea of the costs involved. As well as possibly using tiles for your floor, you'll need to use tiles on the walls around the shower or bath, which should be added after they're fitted. 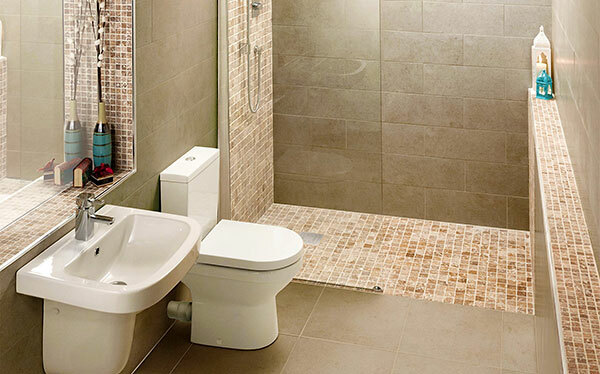 You can also get the same tiles for your bathroom walls and floor if you want a streamlined look. Options for wall-tile types include glass, ceramic or natural stone. There are matt or gloss tiles, and you can have small mosaic ones right through to large tiles, which can make a space-limited bathroom feel larger. Tiles can also be used to make a statement – bold colours or different finishes can have a big impact. If they're used sparingly, such as just around a shower or even statement tiles as a strip running through plain white tiles, it doesn't have to be expensive. If you’re not sure you can afford an entirely new bathroom, there are ways to give your existing one a fresh new look on a budget, without replacing the sanitaryware (toilet, bath, sink and shower). First, you’ll need to do a thorough clean. If the grouting is mouldy, try using a specialist cleaning product, available from supermarkets and DIY stores. If that doesn’t work, buy an anti-mould grout-reviving pen, which you can get in black or white depending on the colour of your grouting. If you choose to redo the grouting altogether, use a sealer that will help prevent staining and mould growth in the future. To help prevent the mould coming back, try to leave the bathroom window open after showering or, if there isn’t a window, install an extractor fan and leave the door open when you leave the room. 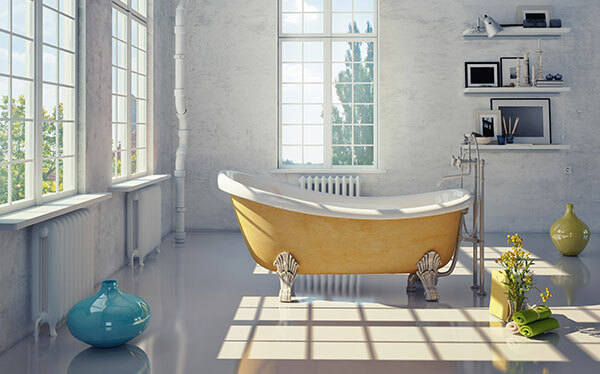 If you are lucky enough to have a cast-iron bath but the ceramic covering has started to crack, consider buying a resurfacing kit or hiring someone to do a professional job for you, rather than replacing it. When you come to sell your home, buyers tend to rate period features. When it comes to decorating, specialist tile paints can give you a new look without the hassle and expense of retiling. Alternatively, consider using board panels – waterproof boards that can be easily secured to the bathroom wall. They come in plain or patterned designs, and some even give a tile effect. If most of the walls are tiled but some surfaces are painted, simply changing the colour of the paint can achieve a whole new look. And because of the relatively small amount of wall you have to paint, it will take less time and money than redecorating an untiled room. Do make sure you buy paint that’s suitable for bathrooms though – ideally, you want to go for an anti-mould, gloss paint. After this, it is a matter of accessorising. Consider buying new curtains or blinds, perhaps adding a new shower curtain or panel, or even putting down a new floor (vinyl’s cheapest). Replacing the mirror and/or door handles can also make a difference, as can seemingly small touches such as the hand towels. If you’re on a budget but want to do more-serious work, for example replacing fittings and fixtures, we would only advise DIY if you know what you’re doing, or you could end up having to pay more to get things fixed than you would have if you’d hired a professional in the first place. Only 9% of the 3,982 people we surveyed installed their bathroom themselves. If you're interested in getting an installer in, visit our page on bathroom installation to find out how people rated Bathstore, B&Q and Wickes' bathroom fitting services. You can also visit Which? Trusted Traders to find a recommended trader in your area that has been through our rigorous checks. As well as installation, you can also find out which are the best and worst bathroom brands as rated by thousands of bathroom owners – the top score was 80% and the bottom just 57%.